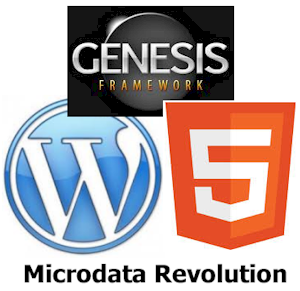 WordPress 3.6 and Genesis 2.0 now support microdata. SEO on your site changes instantly when you use them. And it’s important for you to know the difference in what microdata gives you compared to what you get by using the WordPress SEO plugin by Yoast. This is Part 3 in a series of posts where I’m methodically testing themes, tools, and plugins that will cause a marked difference in the type and depth of content that Google can index on your site. See all the published posts in this series. In Part 2 of this series, I started with a fresh install of WordPress and the Twenty Thirteen theme. Then I added Genesis 2.0 and tested the markup I gained with the Rich Snippets Testing Tool. Now, I’m adding the WordPress SEO plugin by Yoast and I’ve created the most basic authorship setup possible. In this post I’ll show you the results of all the SEO I’ve gained. If you do no more than what I’ve documented in these first few posts, you will set your site apart from the majority of WordPress site owners, and reap the rewards in better search results. I ran the Hello World post through three tests in the Google Rich Snippets Testing Tool. Once with the Twenty Thirteen theme, once with Genesis 2.0 theme, and then with the WordPress SEO plugin and authorship added. Here are the results. I did the best I could with formatting for the following. It’s a little clearer to understand the groupings by looking at the Rich Snippets results directly. So, if you want to have a look, go here then input the URL of the post on my test site. http://www.markup.blogaid.net/hello-world/ It may look a little differently than what is shown here, depending on what I’m testing at the moment. But you’ll get the format layout at least. Authorship: Page does not contain authorship markup. Publisher: Page does not contain publisher markup. hcard error – missing two fields. Needs at least organization, location, or role. All of the basic info was the same as the previous test except for the title in the preview. None of the basic SEO that comes with Genesis was setup for this test. That would have input the proper title followed by the site name. Following is the additional info indexed. You’ll notice that there are seven things listed, but some are not the same as the eight I showed you in the Part 2 post. Notice that the schema for sidebars and footer are not present. That’s because I have no content in either of those places. There is also an additional Person markup for the comments section. As you can see, just with the switch to Genesis 2.0, there is a lot more for Google to index on this post. Now, all of this will not show in Rich Snippets, like the comments and such. Google has a much better understanding of what this content is about, who wrote it, and the engagement it is receiving, and from whom. Here’s what happened when I added the WordPress SEO plugin by Yoast and configured basic authorship settings with my G+ profile. The test results include everything from the Genesis test, with these additions. NOTE: The snippet now contains my profile image, byline, and a link for more posts. All of those elements may not display in the actual Rich Snippet. No one has quite figured out why Google chooses to show what it does, except for the explanation given here – that it depends on the query the user types into search. Publisher markup is verified for this page. The WordPress SEO plugin also added the proper < og > tags for Open Graph. They are: locale, type, title, description, url, sit_name, and image. These are picked up by social media sites like Facebook, to ensure that the correct title, expert, and image are displayed with the post is linked to on that platform. Honestly, installing and properly configuring the WordPress SEO plugin, and then connecting authorship are a must for every site owner. You can do that right now and start reaping the benefits of it while you start learning, and walking into adding microdata. If you’re not already on Genesis, why not? When you’re ready to step up to the best theme framework on the planet, I hope you’ll consider using my affiliate link. But, if you just want to get your feet wet with it first, I’ve got a way for you to do that too. Honestly speaking MaAnna thanks for sharing this post. I have not added any kind of rich snippets in my posts before but now I think I must start using it. Steve, I’m in the process of revamping the BlogAid theme and will be adding custom microdata to a few key pages while I’m at it. That’s above and beyond the site-wide microdata that comes with Genesis. It’s a whole new ballgame now. I’ve got posts coming with easy ways to do the basics, and that’s better than nothing, but the good stuff will still have to be hand coded. My company produces a Plugin for WordPress which was created to augment what the Yoast WordPress SEO Plugin does not add. It is called the WP Social SEO Booster and it allows you to add custom content for Facebook Open Graph, Google Itemprop, Rich Snippets Metadata (including Article Markup), Authorship and Publisher status, Twitter Cards, Image Sitemaps, KML Files/ Local SEO Sitemaps, and more. Mike, your plugin is actually on my list to review. I’m starting with the basics for doing markup and moving through more advanced ways of doing it while showing the exact results you get. So, your plugin is a little later in the series since it can do so much. But, I’ve already been hearing great things about it. Looking forward to putting it through its paces. First, wanted to note that I just stumbled on your site via a search for “Genesis 2.0 SEO vs Yoast SEO” and am THRILLED I did. I’m a total newbie blogger who’s been reading tons of books and blog posts on site architecture, seo, newsletters, etc. but still am constantly dogged by questions that I can’t find directly addressed–especially, since I’ve settled on Genesis 2.0 (and installed its sample child theme) on my site. Your site looks like a total GOLD MINE. So thanks a million–very much looking to pouring over your archives! Quick question on this post’s topic, though: I’ve been seeing recommendations for SEO plugins balanced about equally between Yoast’s and the All in One SEO Pack. I’m assuming that since you’re testing Yoast with Genesis here, you would recommend it over All in One. Could you give us a few lines, though, about why you think Yoast is substantially the better option? Thanks a million, from a new dedicated superfan! Thank you so much for your kind words!!! So glad the site is helpful to you. I’m totally sold on the combo of Genesis and the WP SEO plugin. They integrate perfectly. And Joost keeps totally on top of changes with Google. So, hooking up things like authorship and publisher coding are a breeze. And, his plugin includes all the social integration you’ll need too, like the OG tags for Open Graph. On top of that the XML sitemap it generates is super (be sure to submit it to Google Webmaster Tools). I appreciate that I can completely customize the global SEO for the entire site, and then customize SEO for search on a page/post level too. I haven’t used AIO in a couple of years, so have no idea if it has kept up with all of that. And don’t care. Joost has too many other premium plugins for Local SEO and Videos that integrate with the WP SEO plugin. So, for me and my clients, it’s the only way to go. Thanks a million for your incredibly fast and helpfully detailed response, MaAnna! I’ll be installing Yoast today and reading your other tutorials and such on it. Also looking forward to upcoming articles in this series! And doubtless, too, I’ll soon be a customer as well as superfan. :) Meantime, though, count on me to be promoting the heck out of you and BlogAid on both my site and SM outposts. Cheers! Happy to help, and thank you so much for spreading the word!! Lots easier and cheaper to bring in real help before you spend a lot of money and time learning the hard way! !